We at the Washoe-Storey Conservation District are looking for new Board Member and volunteers. 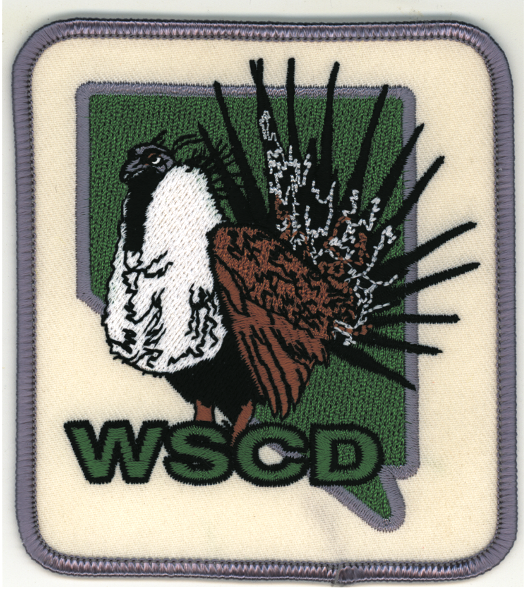 WSCD Sage Grouse Patches are available! $10 Donation Patch, Help Support Your Environment! This is a picture from the Eagle Scout Project that was sponsored for the Nevada Department of Conservation and the Washoe/Storey Conservation District. 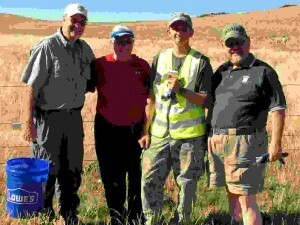 The Eagle Scout Project consisted of hanging specially designed markers along five barbed wire fenced enclosures in the Spanish Flats area, north of Winnemucca Ranch. These enclosures which are setup to support and protect the valuable wetland and springs habitat, but pose a threat to sage grouse. The project is to help the local sage grouse population be able to see the fences before they fly into them, thus avoiding injuries and potential loses of the species. Pictured left to right are Kevin Roukey, WSCD Manager; Barbara Stewart, Reno Elks Lodge Youth Activities Chair; Keegan Mulcahy, Eagle Scout Candidate; and Jim Stewart, BSA District Leader. We at the Washoe-Storey Conservartion District are looking for new Board Member and volunteers.